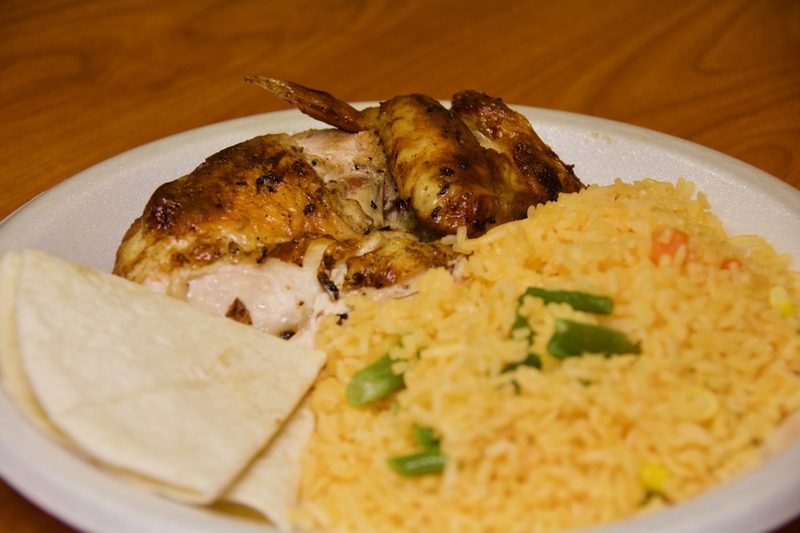 Pollo D’oro is a Latin American family owned restaurant created by two brothers and their families working together to bring you delicious and authentic flavors. Everyone at this restaurant is warm and welcoming from the time you walk through the door to ensure you the best experience they can offer. The menu offers a number of dishes where the protein can be ordered on its own or in a meal for yourself or family portion. 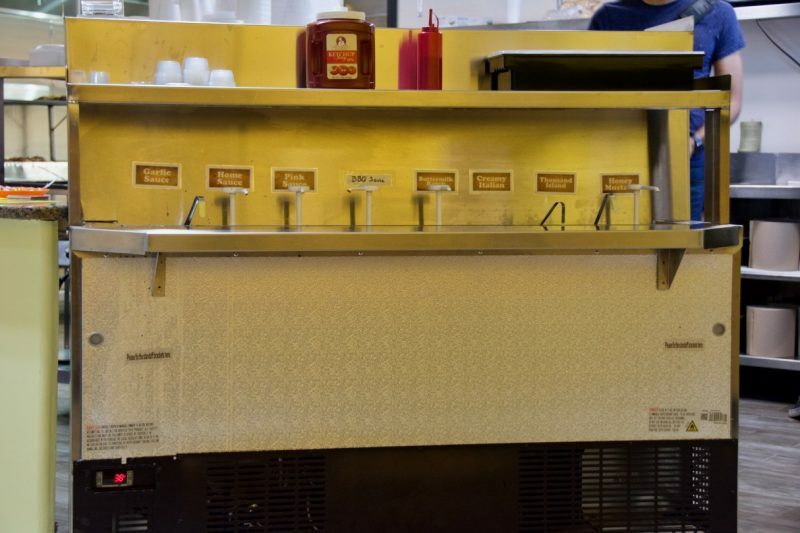 Meals offered include options for certain sides, while you can order other sides separately. You can see everything behind the scenes when looking past the counter to see how your dishes are made. All meats are fresh and marinated in tropical juices and spices. 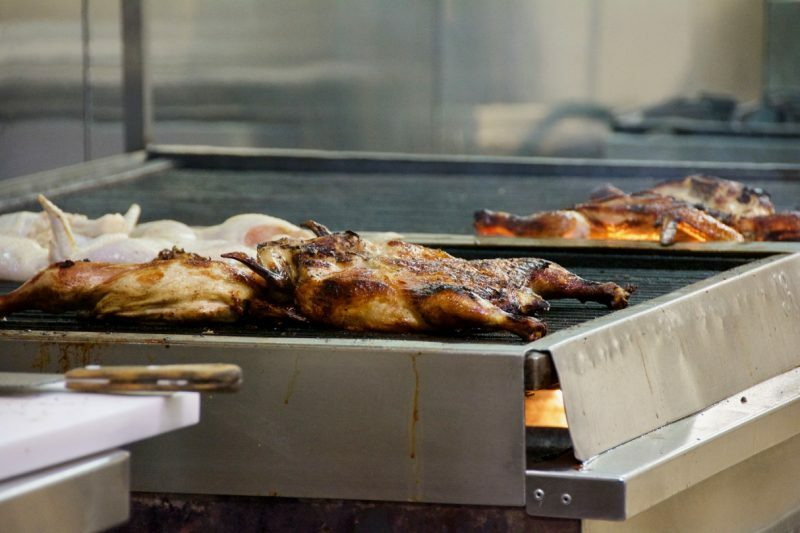 Here, you can see my chicken being cooked on the grill made per order, which may take a little time before it makes it to your table to ensure freshness. While waiting for your food, check out the sauce bar filled with delicious concoctions you can create for your palate. My favorites include the garlic sauce for fried items, while I enjoy the house sauce and pink sauce for my grilled chicken. The house sauce has nice spices, while the pink sauce is more mellow and is mayonnaise based. With your grilled chicken, they also provide some tortilla if you’d like to create a mini taco or wrap yourself. Adds a little fun to your meal! The Grilled Chicken was SO flavorful, moist and tender with crispy skin. The flavors are amazing and makes my mouth water starting a few hours after eating this dish. I wish I had more… if only I lived closer. The yellow rice brings its own flavors to the table and served with some vegetables mixed in. Grilled chicken with bone-in isn’t your fancy for this meal? 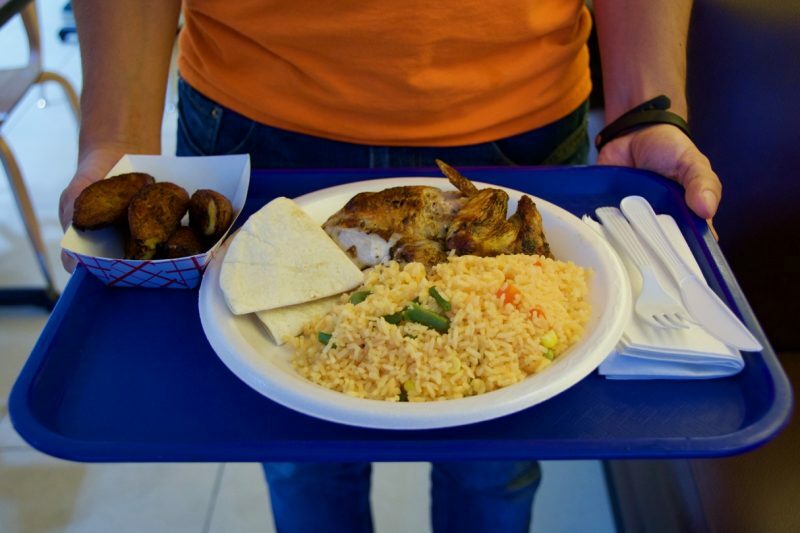 Try their Boneless Chicken Breast Platter, which can be served with white rice and beans like how it is pictured here. 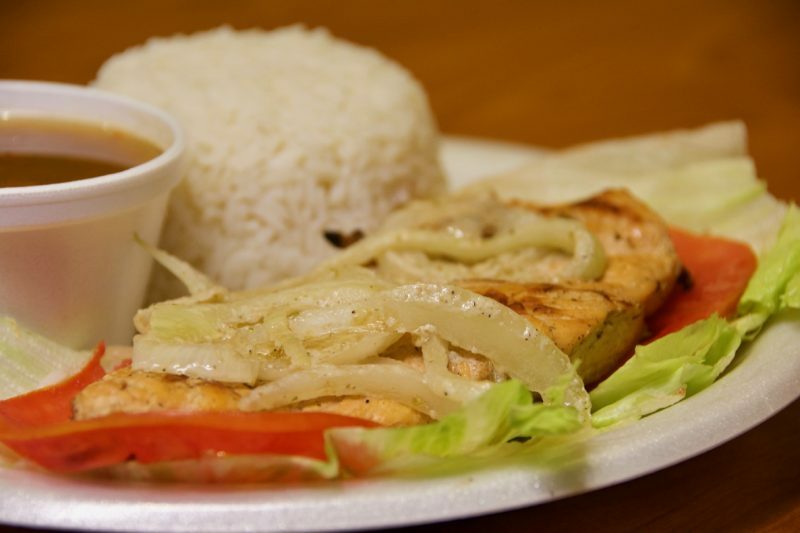 The chicken is served on fresh lettuce and tomato slices with cooked onions to top it off. Again, the chicken is flavorful, tender and moist no matter what method it’s made and served. The beans at this restaurant is soft but not mushy, which makes a nice additional protein to your dish. Another chicken dish not photographed (because I was too excited and ate it fast) is their Fried Chicken Wings, which is great when dipped in the garlic sauce. 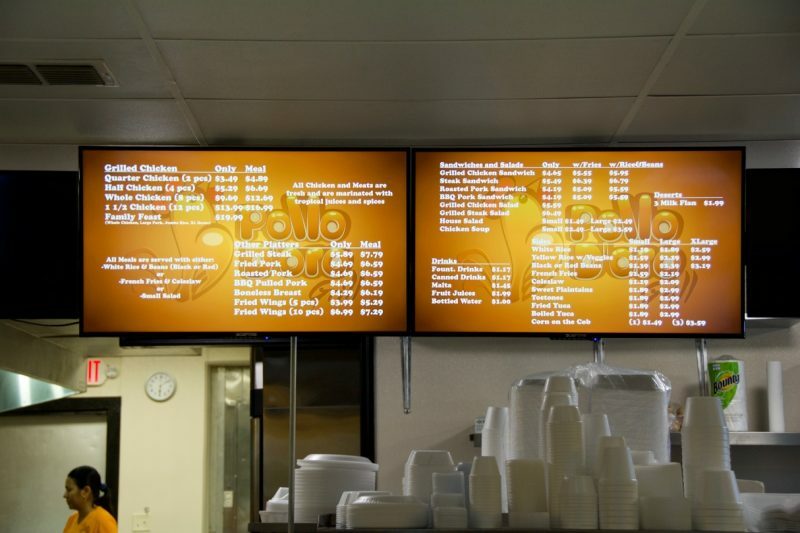 If you’re not in the mood for chicken, Pollo D’oro also offers other proteins offered in platters, sandwiches or salads. However, they may suggest the chicken for your first visit because it is their bread and butter! 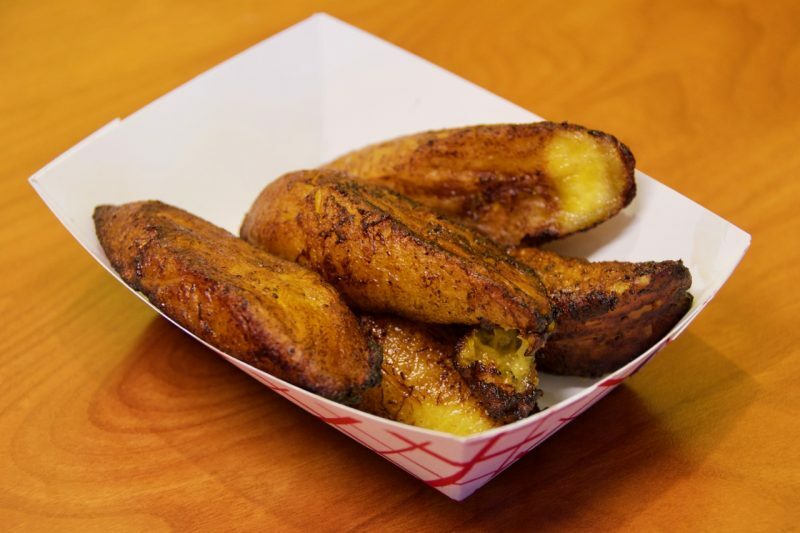 Sweet Plantains can be offered as a small or large side. Both options are great to share with friends and family while enjoying your meal. Growing up in South Florida, I have missed delicious sweet plantains and I’m glad I found a place can make it similar to the sweet plantains I’ve had when down south. Before you leave, try the unique Tres Leches (3 Milk Flan) cake made in-house. It’s unique at this location with the fruit they’ve added to the cake. 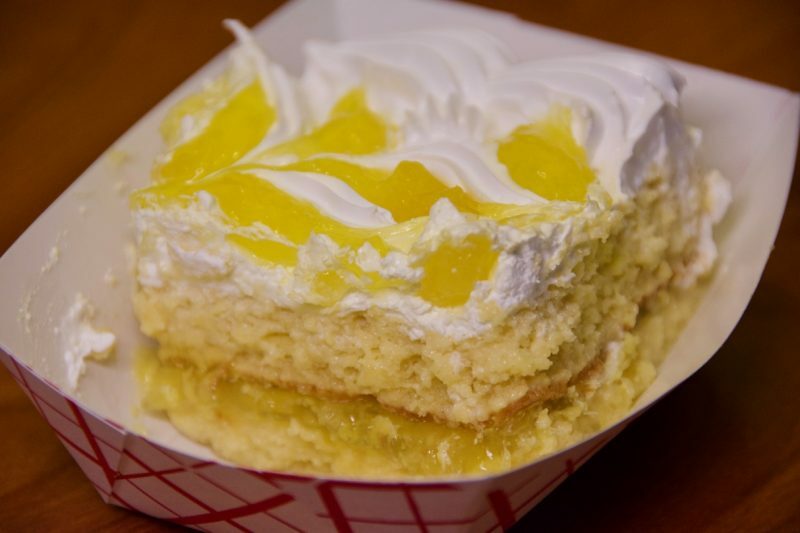 A little pineapple adds a new touch to the cake itself. For a taste, stop by Pollo D’oro at 4542 Hoffner Ave, Orlando, FL 32812 or give them a call at (407) 270-4757.